I heard a lot of rave reviews about When Life Gives You Lululemons, and while I never read any of the other instalments of the Devil Wears Prada series I figured I’d give it a go. I’d only ever watched the movie version of The Devil Wears Prada, but I loved Emily’s character, so a book featuring her as one of the main characters couldn’t be bad! 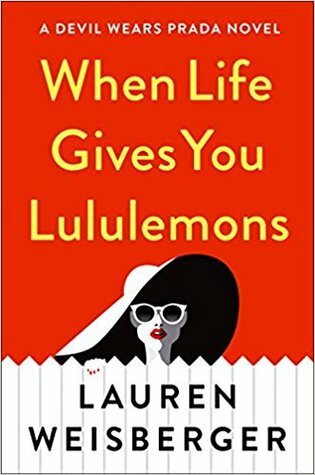 When Life Gives You Lululemons was a fun and fast read, and I really enjoyed following the three women along on their journey together. Miriam was super relatable to me in many ways and I loved her relationship with Emily and Karolina. The trio kept one another in check wonderfully and their friendship is something every woman should strive to have. “I got your back but will call you out if you’re being an idiot” is definitely the kind of friendship I’m down to be in. I never found the book to be overly predictable and found myself obsessively reading to find out what was going to happen next. My one and only gripe is that ending seemed a little rushed, as if Weisberger had a word-count to adhere to and needed to wrap things up before chapters got left out. All in all, When Life Gives You Lululemons is a great summer read that is easy enough to follow along to without getting boring. I give it 4 stars out of 5. We’re on the same page ;) I just reviewed this book as well, and agree on all accounts!